On Behalf of Animals was produced for the Massachusetts Society for the Prevention of Cruelty to Animals (MSPCA) by Harvard’s Film Foundation. This was a documentary film that featured scenes of animal rescue and care at the MSPCA’s various sites, including the Angell Memorial Hospital, and the Rest Farm for Horses at Methuen. 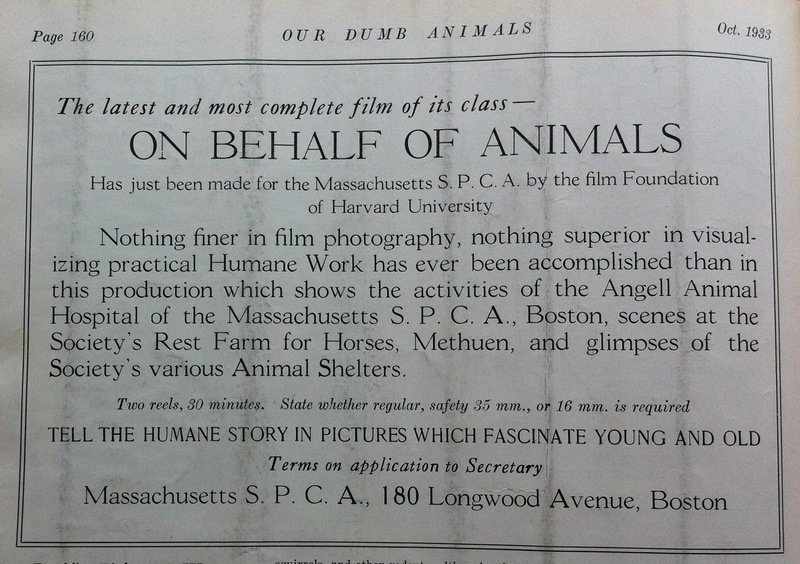 Advertisement for “On Behalf of Animals” in the October 1933 issue of Our Dumb Animals. Collection of MSPCA Angell. Throughout the 1930s this film was advertised in conjunction with The Bell of Atri, especially in the months leading up to Be Kind to Animals Week®. While the two films differed in genre–one a narrative drama, the other a documentary–they complemented on another in terms of animal advocacy and Humane Education.